Gloria's blog is a mini-exhibit of art created and owned and updated by me Gloria Poole,RN,artist of Missouri and Georgia and I own all rights to it. I, Gloria Poole, Registered Nurse licensed in Missouri, artist in all art mediums, photographer at times cartoonist at times, author, illustrator at times, mother, g-mama , Republican, prolife activist, personhood promoter, White, Southern Baptist Christian single-again woman, drew this at 2am last nite, with Inktense on 8 x 11 cardstock paper, then put glitter on it to make it more iridescent. I also signed it, photographed it more than once, uploaded it, and after 4 attempts to get login code [cybercriminals have tried since yr 2006 to steal this acct from me] am posting it to this blog of mine today 25th June 2016 at 1:02pm. 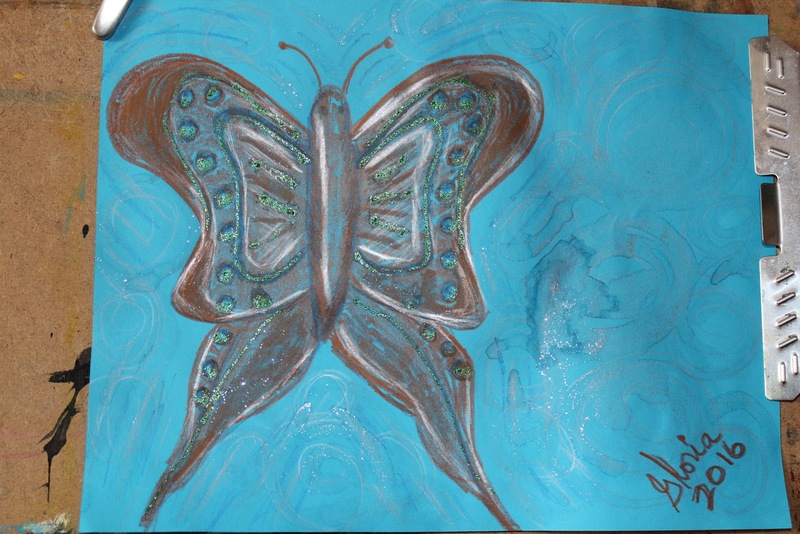 This is an entirely created-by-me butterfly that does NOT exist in nature. Copyrighted, and I, Gloria Poole, own all rights to this blog as a whole and to ALL art, images, photos, designs, words, individually as posts or art that I CREATED. This is NOT a shared account and was NEVER a shared account, nor is this a shared apt in Missouri, nor is this a shared isp acct nor are my telephones shared. Also, thank you very much to viewers/ readers of previous blog post in US, Spain, France, India, Netherlands and Romania. I appreciate it very much! Also, see the full list of 54 countries & city states that view or read my blogs --different blogs at different times I suppose depending on title?-- that I posted to my https://gloriapoole.blogspot.com. Also, ALL telephones on this account belong to me and are located in my apt in Missouri where I have lived since Oct 2009. The internet dedicated line telephone line account I login to this account and any account of mine with is my so-called PRIVATE internet account that seems to have a direct hook-up to the White House old Hillary's campaign center so they read what I write in real time. The number w/ 864 in it belongs to me and always belonged to me and it is one of my cell phones that criminals have been trying to steal since May 27th. They are on the payroll of that GOD-forsaken Hillary Clinton who breaks into computers to rig the election and to censor speech in her effort to prevent people from writing words that oppose her. She is an evil person who takes kickback money from killing places. Hillary's criminal hackers are STILL breaking into my private computer, flaunting all US laws and DARING the FBI to arrest her. Hillary Clinton is from hell because she is the puppet of the killing machine "Planned Parenthood". You can follow me on twitter at : @gloriapoole; @gloria_poole; @ProlifeNurse; @Tartan_Bliss; @tweetie0817;and each is different. https://gloriapoole.blogspot.comUpdated by me Gloria on 24th June with sketch I drew & painted of "aircraft carrier"
https://gloria0817.blogspot.comUpdated by me Gloria on 23rd June with sketch I drew and painted of 'tomato soup"
https://gpoole817.blogspot.comupdated by me Gloria on 21st June w/ sketch I painted "abstract in soft pastels"
https://gloriapoole1749.wordpress.com Updated by me Gloria on 20th June with sketch I painted of "rain at beach"
https://artist-gloriapoole.blogspot.comUpdated by me Gloria on 18th June with sketch I painted "Gannett's landing "
http://gloriapoole-UK.livejournal.comUpdated by me Gloria on 16th June with sketch I drew "dancer with long limbs"
https://tapestry-of-life-LLP.blogspot.comTapestry of LIFE updated by me Gloria on 4th June with ""humans are the clay of GOD and a sketch I painted to illustrate it." https://gloriapoole.wordpress.comUpdated by me Gloria on 10th June with sketch I painted "watermelon" , in watercolor"
http://gloriapoole.livejournal.comUpdated by me Gloria on 12th june with sketch I painted "hazy day at beach"
https://sites.google.com/site/PooleGloria Updated by me Gloria on 18th June with sketch I painted "tidal wave"
https://publishing-life.blogspot.comPublishing LIFE updated by me Gloria on 10th may with medical photo I photographed that day"
https://sites.google.com/site/gloriapooleThis is one of my very first sites of web that I posted art I made too. It still has some of that same art I made on it. https://cartooning-by-gloriapoole.blogspot.comMy cartooning site that includes the story I wrote and illustrated with original art I made[ and have the originals on paper ] entitled, "The Adventures of Lady Bugs that give picnics" and I wrote it over 3 years and it is on that blog and I reorganized it into the top post so it flows easier. I also copyrighted it on paper with the Library of Congress Copyright office. https://sites.google.com/site/gloriapooleMy very first site I posted art I made too which still is much the same as then, with occasional minor updates by me. I, Gloria, recently added more ethnic series art I made to it. https://sites.google.com/site/lifetv/Medical photo of human embryo in amniotic sac. and other blogs and sites that I own and own all, rights too, and that I created to begin with and update intermittently. I do not conform my blogs to each other which means every one is different. So if you want to see most of the art I have created and posted on web since year 2007, you would have to look at every blog and every site and every public photo album of mine. This is my copyright notice for this blog and all content on this blog, all art that I created, all photos I photographed and all words I wrote, which is 100% of the art, photos and words on this blog. I, Gloria Poole,RN, artist; of /in Missouri own ALL rights to this blog and to all content on it. All telephones associated with this account AND ANY ACCOUNT OF MINE are my personal telephones and are located in my apt in Missouri and or in my possession if I walk about. I ALSO have a wired, landline telephone in Missouri. I have other telephones besides the ones listed on this account for my safety sake. 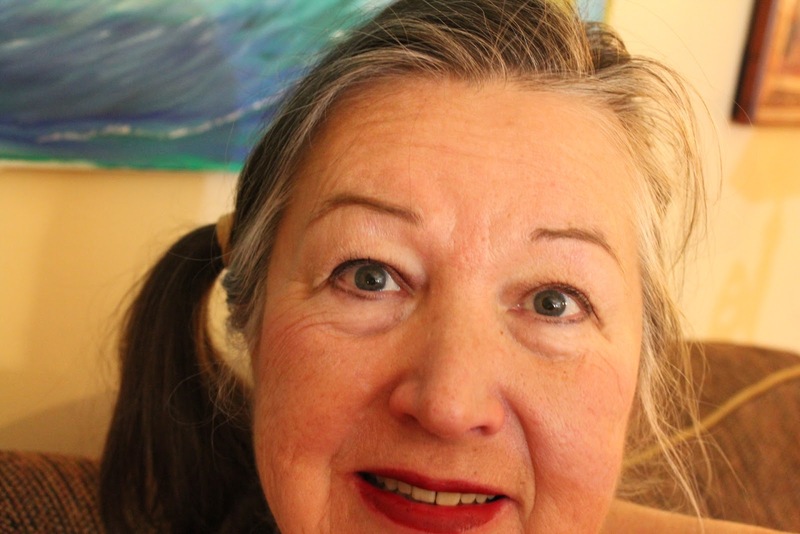 This is ME as I LOOK this year even today : Gloria Poole, Registered Nurse licensed in Missouri and artist in all mediums, and photographer, writer, author, prolife blogger mother, grandmother of minor children and SOUTHERN BAPTIST CHRISTIAN, single-again, twice divorced white woman AS IS LOOK THIS YEAR, TODAY. I do not have blonde hair and NEVER had blond hair even as a child. The peroxide blond who tried to steal my identity is in no way associated with me or anything I do. 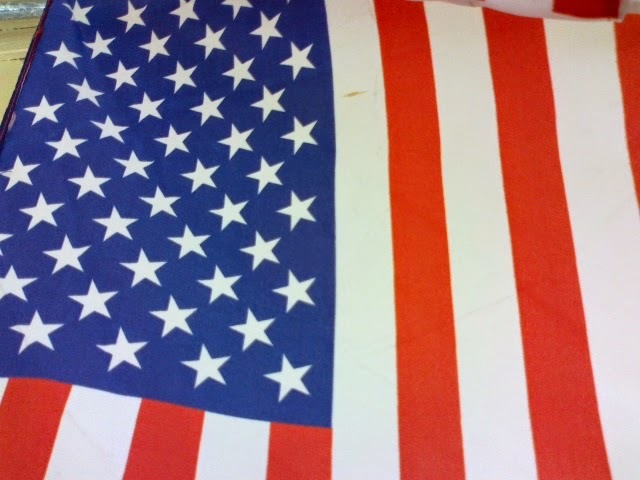 This is one of my photos of the U S flag I photographed on walkabout to remind all I am U S citizen and have all Constitutional protections including the first amendment. This is one of my Christian crosses to remind all that I am raised Southern Baptist, born again Christian believer and that I adhere to the Holy Bible as the inspired Word of GOD. This SELFIE of my hand is as it looks this year 2015. 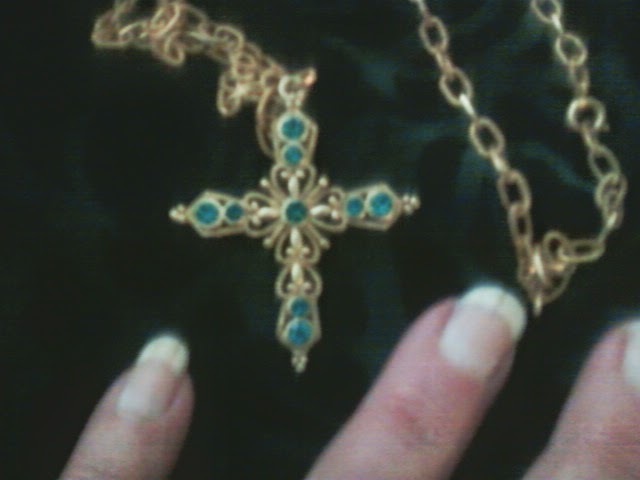 That necklace is of type of Southern Baptist/Great Commission Baptist Church, which adheres closely to Holy Bible. I do not make nor worship images of GOD, nor of idols. 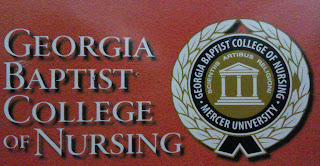 The seal of my alma mater Georgia Baptist College of Nursing where I graduated from nursing college years ago, and took state licensing boards in the state of Georgia, also years ago, and have a Registered Professional Nurse license in Missouri. 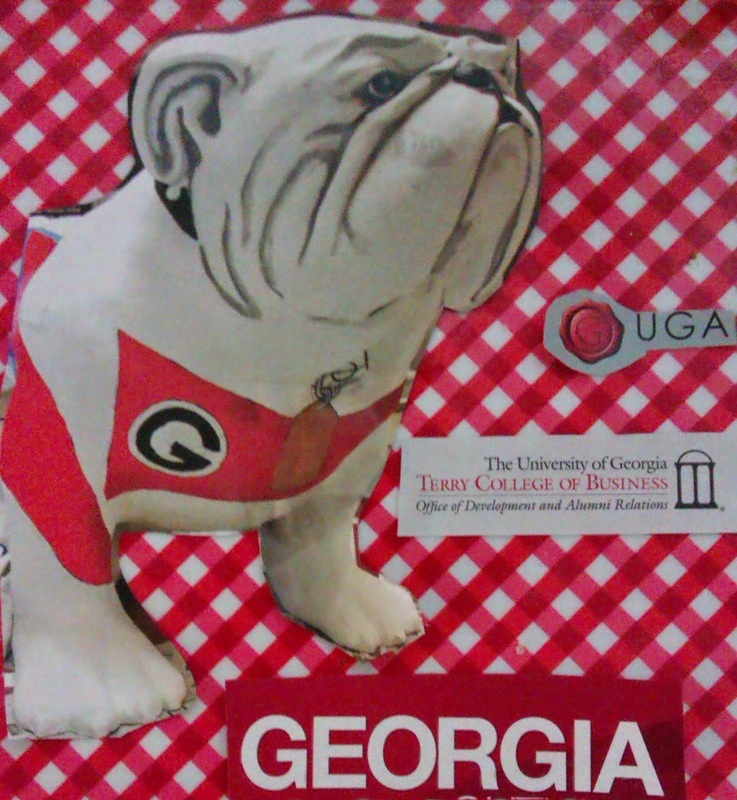 This is a display I made to show the world that I am also a graduate of the University of Georgia Terry College of Business and the symbols on this display I made are symbols known to be University of Georgia in Athens Georgia. Copyright notice: I, Gloria Poole,created ALL content, all photos, all words, and all art on this blog and I, Gloria Poole,RN, artist, author, photographer, blogger, writer, own all rights exclusively to all content on this blog. 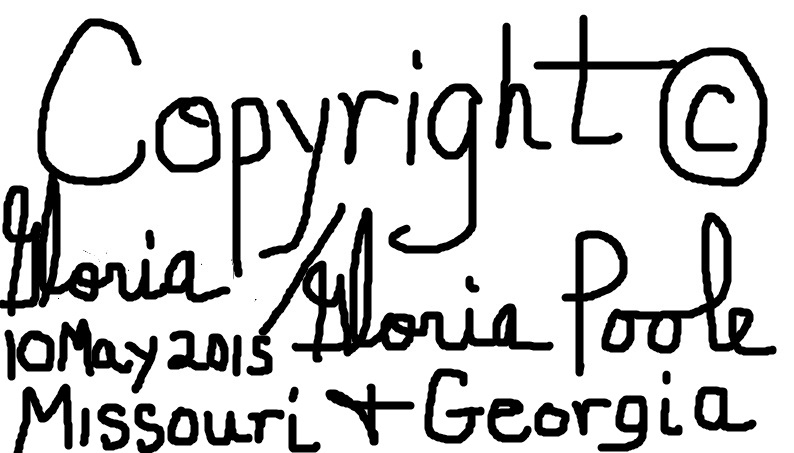 Usually I sign the art I create as simply Gloria since that is my first name, that I was born with; but on pencil and or ink drawings I sometimes also sign my born with surname of Poole which is my legal name again because I removed the Pappas name from my name at time of final divorce decree in Oct 2007 from male DBP, and I resumed my full maiden name, including my born with surname of Poole, by Court order at the same time. I am also known on the web and in real life as Gloria; Gloria Poole; Gloria J Poole; Gloria Poole, RN, artist; and on the web as : gloriapoole; gloria-poole; gloria.poole; Ms Gloria Poole; gloriapoole.RN; gloriapoole_RN; gloriapooleRN at yahoo; gloria0817; gpoole817; artist-gloriapoole; gloriapoole-paintings; artist-gloria; Poole,Gloria; gloriapoole1749; and other variations of my real, born with, and legal name of Gloria Poole. For the record, I am a white, single-again, twice divorced, Southern Baptist, born again, Christian, woman and the mother of only two children who are grown daughters who are named Jennifer and Leigh. I am also a prolife activist, blogger, artist in all mediums; photographer for my own purposes, Registered Nurse with a license in Missouri but before that for most of my life in the state of Georgia, U.S. citizen born in the state of Georgia; University of Georgia alum, Georgia Baptist College of Nursing alum, writer, illustrator, author, personhood promoter. This blog may not be downloaded, nor copied individually or collectively as a whole; nor have domains forwarded to it that do not belong to me, nor may the photos or art on it be reproduced or saved to disk by anyone . The constant unrelenting attack on this blog by atheists, perverts and abortionists is politically motivated in an attempt to censor the prolife words and scriptures that I post to some blogs of mine. This blog is as secure as ANY blog that is located in the continental United States. The so-called "revenge p-o-r-n" that is NOT on this blog but which tried to hijack my real name and my blog has already sent some people to prison. IF you hack this blog, or steal my name or my content, the FBI will send you to prison. 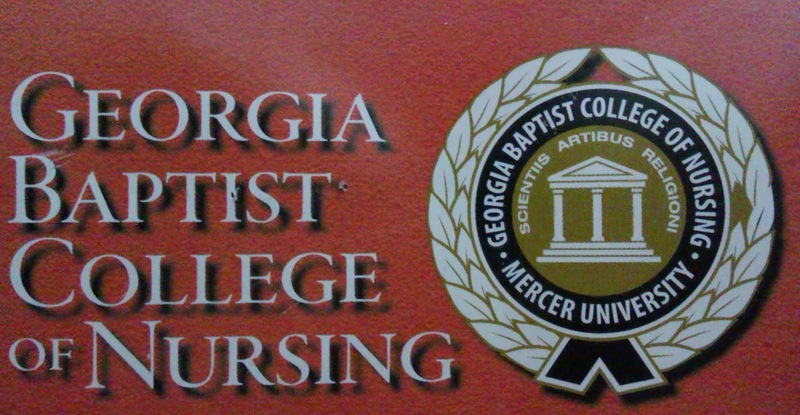 This blog and all content and rights to it belongs to Gloria Poole,RN, of Missouri and Georgia.. Simple theme. Theme images by johnwoodcock. Powered by Blogger.